Grafeo is a simple framework for manipulating graphs. Grafeo provides node and edge morphs that connects each other. You can use it your own application and extend for your purpose. Grafeo also has a simple demo application of making graphs. 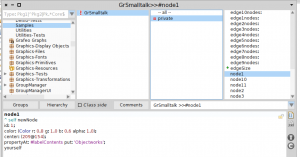 Grafeo is written in Pharo Smalltalk, a pure object-oriented programming language. Grafeo is downloadable at SmalltalkHub. If you are using Pharo 3.0, you need to install a package prior to Grafeo installation. Select the following code and do it. Grafeo is intended for a graph application framework, but it also provides a simple application for evaluation. Doit the code above or select ‘Grafeo’ in world menu, then a simple window will be appear. The window consists of three panes: menu pane, graph pane and shell pane. Menu pane has some buttons for opening existing graph, saving graph, importing or exporting graph in GDF format, and so on. 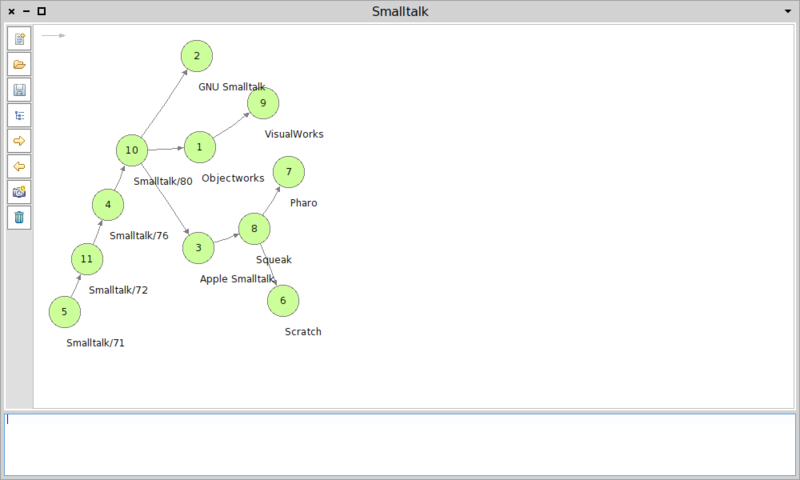 Graph pane is an area that you can make graph using nodes and edges. Shell pane is command line interface for Grafeo. For adding new node, click on graph pane, then select ‘add node’. For connecting nodes with edge, click on a node with holding Ctrl-key or right-click on a node, then drag edge’s terminal and drop it on another node. You can change label and color of both nodes and edges from each menu. Clicking on an edge, three small circles are showed. They are handles for manipulation,that terminal handles attach/detach nodes, center handle makes an edge curved. Handles are hidden when clicking again. For edge menu, right-click on the edge. 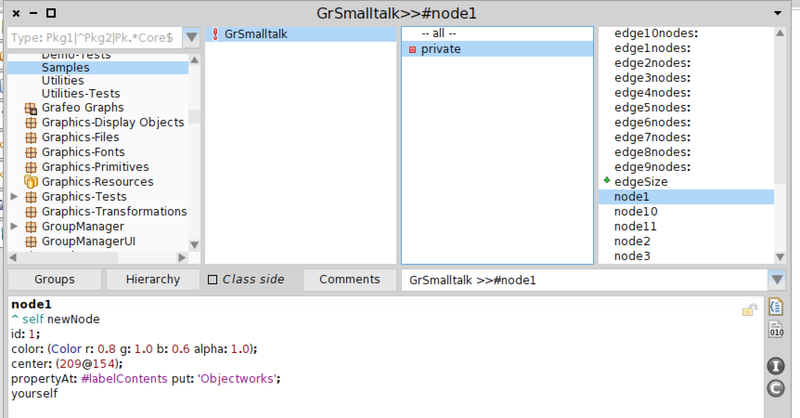 When save a graph from menu button, the graph is saved as Smalltalk class, not any files. You can browse the generated codes by Nautilus browser from browse menu button. 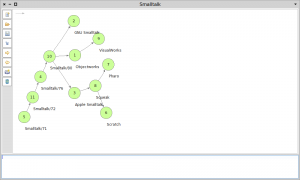 If you want the graph to store in file system, you can export a file in GDF format or file out the generated Smalltalk class.